Intellectual Property (IP) law provides protections to brands and private label Amazon Sellers. Intellectual property rights protect against trademarks, copyrights, patents, trade dress and other issues. Intellectual property right complaints are often used against Amazon Sellers. When a person or company makes a complaint on Amazon based on intellectual property rights, they are often referred to as “rights owners” complaints. Amazon Sellers are frequently suspended because of rights owner complaints. If an Amazon Sellers account is not suspended, a rights owner complaint will cause the inability to sell a particular ASIN or group of ASINs. 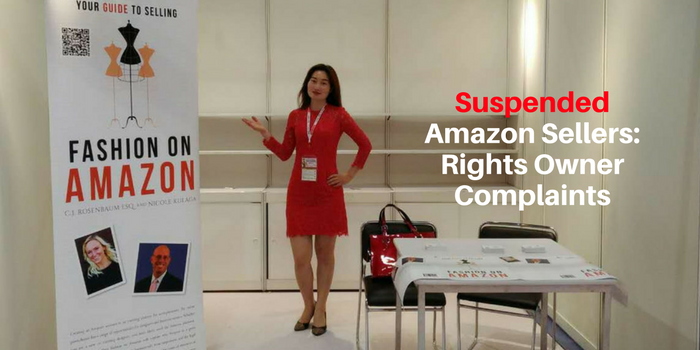 If your Amazon Sellers Account is suspended because of a rights owner complaint, Amazon Sellers often need more than just a Plan of Action. Amazon will almost always reinstate your account after receiving the approval from the right’s owner. However, obtaining a withdrawal of the rights owner complaint is not always easy. Rosenbaum Famularo, P.C., the law firm behind AmazonSellersLawyer.com, helps suspended Amazon Sellers with rights owner complaints every day. Our goal is to obtain the withdrawal of the complaint and get our suspended sellers back on Amazon as quickly as possible. Amazon Sellers Lawyer recently helped a client reinstate their suspended Amazon account after it was suspended from a rights owner complaint. As we have done many times, our law firm convinced the right’s owner to withdraw their complaint against the suspended Amazon seller. Rights owners’ complaints usually result from brands doing “sweeps” of their listings. A “sweep” is intended to eliminate unauthorized distributors from selling their products. A “sweep” is essentially an attempt to remove unauthorized distributors from selling products on a massive scale through Amazon’s intellectual property right complaint system. CJ’s Note – Amazon directs sellers who receive IP complaints what to do. Amazon first wants the seller to contact the complainant and obtain a withdrawal. Most intellectual property rights complaint asserted on Amazon are baseless based upon the United States first sale doctrine. By knowing the law, you can often obtain a withdrawal of the complaint. If you think about it from the brand’s perspective, they will sweep off 20 or 30 sellers with one baseless intellectual-property complaint and may be one of those sellers opposes it with some knowledge of the law or a lawyer who is familiar with both intellectual property law and Amazon. If you aren’t able to obtain a withdrawal of a baseless complaint, you can then use the arguments from your communications with the brand with Amazon and try and get Amazon to ignore the complaint. Our client, in this case, was lawfully reselling true mark items in brand new condition. The wrongfully suspended Amazon Seller was wrongfully victimized by a baseless rights owner complaint. We sent a legal letter to the right’s owner explaining their mistake. We also set forth several legal defenses on behalf of our client. We asserted our client’s right to the First Sale Doctrine and obtained a retraction of the complaint. The First Sale Doctrine is one of the more important laws Amazon Sellers should be familiar with in order to protect themselves from baseless intellectual property complaints. The First Sale Doctrine provides that any Amazon Seller that purchases a branded item can resell that item so long as it is in an unchanged state. Amazon Sellers who stock, display, and resell genuine products bearing a true mark are generally protected by the essence of the First Sale Doctrine. If an Amazon Seller merely resells authentic products in the exact, unaltered condition as they received them, which is the exact condition as listed on Amazon, then they may assert the First Sale Doctrine as a defense against baseless rights owner complaints. If a right’s owner is unresponsive or uncooperative, then an Amazon Seller should contact Notice-Dispute@Amazon.com and/or Amazon’s legal team to escalate the appeal process and explain the situation in detail. Amazon may override the unresponsive right’s owner and allow the Amazon Seller to submit a Plan of Action to them directly. An Amazon suspension for an IP complaint is a challenging suspension to overcome. Suspended Amazon Sellers should first contact the complainant and seek a retraction of the complaint. If applicable, an Amazon Seller should assert the First Sale Doctrine. Suspended Amazon Sellers should always draft a strong Plan of Action. If an Amazon Seller requires further assistance dealing with the complainant right’s owners, contact a law firm focused on suspended Amazon Sellers, seller account suspensions, and right’s owner complaints.